If you’re looking for a one-of-a-kind flooring or patio finish, look no further. 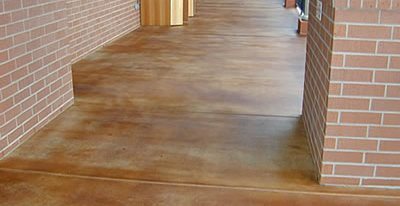 Stains can be used to impart rich color to both new and existing concrete that will last for years. With a variety of stain colors to choose from and options for adding decorative patterns such as saw cuts and stenciling, stains are anything but boring. Use the resources below to discover what's possible and for even more inspiration check out our concrete floor design ideas to see stains being used to create logos, water-inspired floors and more. Concrete Floor Types Design ideas for using concrete for kitchen floors, bathroom floors, restaurant floors & more. Concrete Style Guides Download these design sheets for concrete floor ideas in modern, old-world and traditional design schemes. Concrete Rug Looks as Warm and Inviting as the Real Thing from Art Over Concrete in Murfreesboro, TN. Homes Damaged by Katrina Resurfaced with Concrete. Submitted by Deco-Crete Designs, LLC in Gretna, LA. Concrete labyrinth created at Nuns Convent in England. Check out the photos! Unexpected Effects with Acid Staining Are Part of Its Appeal from Select Coatings, Inc. in Boynton Beach, FL. Concrete Coins: Pulling Off a Bank Job Requires a Few Accomplices from Images in Concrete in El Dorado, AR. Skateboarders Surf the Wave of Decorative Concrete at new Skatepark in Santa Cruz, CA. Decorative Concrete Wears Well at Philadelphia Premium Outlets™ from Architectural Concrete Design in Levittown, PA.